We laughed. We cried. We survived. My problem with NAW is that the focus is on recruiting potential adopters, without much in the way of discussion about the reality of parenting a traumatised child. I don’t want to rain on any parades. I’m gay, ergo I love a good parade. It’s in the Gay Rule Book: thou shalt love a good parade. What I would like though, is for NAW to reflect the reality of being adopted and being an adopter, rather than some honey coated version of ‘lucky’ children and ‘amazing’ adopters. Bubble was diagnosed with ARND, Alcohol Related Neurodevelopmental Disorder. Aha! I hear you cry. Bet that diagnosis had the professionals flocking to offer support! Err, well, no actually. Nothing. Nada. Diddly squat. Zip. The Consultant Geneticist told us there was ‘no point’ referring Bubble to the Paediatrician. Oh hang on! I’ve just remembered. There was an offer of support: school wondered if she needed a hearing test. I found myself having one of those Twilight Zone Floating Above Your Body As You’re Saying It Because It’s So Ludicrous That You Should Have To Say It experiences, explaining to a teacher, SENCO, social worker, and educational psychologist, that it is Bubble’s memory and executive functioning that are damaged rather than her ears. We’ve been left to work out for ourselves what this diagnosis means, how best to support Bubble, and to once again plead with the school to embrace her differences and needs. Having been advised Bubble would not get an EHCP, we’re currently completing the forms ourselves. We don’t think we will be successful, but we have to do everything we can to attempt to get the right support for Bubble. We’re hoping that at least with it all written down it will focus the school a little more on the support she needs to reduce her anxieties. We attempted to have a dialogue about Bubble’s transition to a secondary school setting. We asked for a therapeutic educational environment, but were advised by a social worker that in order to possibly come anywhere near achieving this Bubble would have to ‘fail and be excluded’ from a local secondary school. (Insert your own swear words here. I’ll stick with my new favourite phrase, courtesy of @NowWeAreSix, ‘say WHAT now?’) We were then advised to ‘go private’. We visited a semi-local secondary school, and were delighted to discover the SENCO actually Gets It. The school is fairly small, all the staff have been trained in Attachment Awareness, and the SENCO has agreed to come to our next meeting at Bubble’s junior school. Cue virtual kissing of said SENCO. I am still wondering whether I actually dreamed this meeting. I don’t think I did, as the SENCO was wearing what can only be described as stripy Cuban heels, and I cannot imagine that my subconscious would tolerate such a fashion faux pas within an educational setting that is not the New York School of Performing Arts. We finally started Dyadic Developmental Psychotherapy. We have a fabulous psychologist and are now obviously in a wonderful state of co-constructing narratives with Bubble, who would much rather be eating or watching television. We take our co-constructing chances where we can. We will get there. This will help. We have decided this. Squeak moved up to junior school, and twice endured being referred to by her birth surname. The first time was in front of her entire year group on the taster day. Cue apologies and assurances from the Head that it would never happen again, staff understood how upsetting this was etc and so forth. The second time occurred on Squeak’s first day at junior school. This time her old surname was plastered over books, coat peg and drinks bottle. Squeak is now bed wetting most nights. Sometimes twice a night. Her anxieties are ramped up. Her controlling behaviour is totally over the top. At least we don’t need to wonder what prompted this. We’ve asked for an assessment for life story work. My employers decided that after 2 years flexible working I had to work full time. No negotiation. According to my then line manager I ‘knew what I was taking on’ when I adopted. Caring for 2 developmentally traumatised children doesn’t really fit with being a full time social worker in a local authority, so I forked out for a lawyer, won my case, and left. We worried all summer about the possibility of one of Bubble and Squeak’s siblings returning to care. Thankfully it did not happen. They’re all still clinging on. Theirs is another adoption reality story. My adopted niece continues to run away from the local authority care to which she had returned. Currently she is hiding out at a ‘boyfriend’s’ house and refusing to return to the care home. There’s more adoption reality for you. My partner and I set up a local adoption group. To be fair the local authority had made an attempt to do this a few years ago, but there was very poor attendance at their initial planning meeting so they immediately gave up. Oh well! They had tried, hadn’t they? The ‘we tried, honestly we did’ box had been ticked for the inspectors. We now have a thriving, supportive, friendly group of adopters who share knowledge and experience, and help each other to do the best they possibly can for their families. How did we do this? We networked. We used our charm and ready wit. We made it appealing. We chose a comfortable friendly venue. We offered sandwiches. We got a lot out of @TheOpenNest’s brilliant conference in July. We met some lovely people. 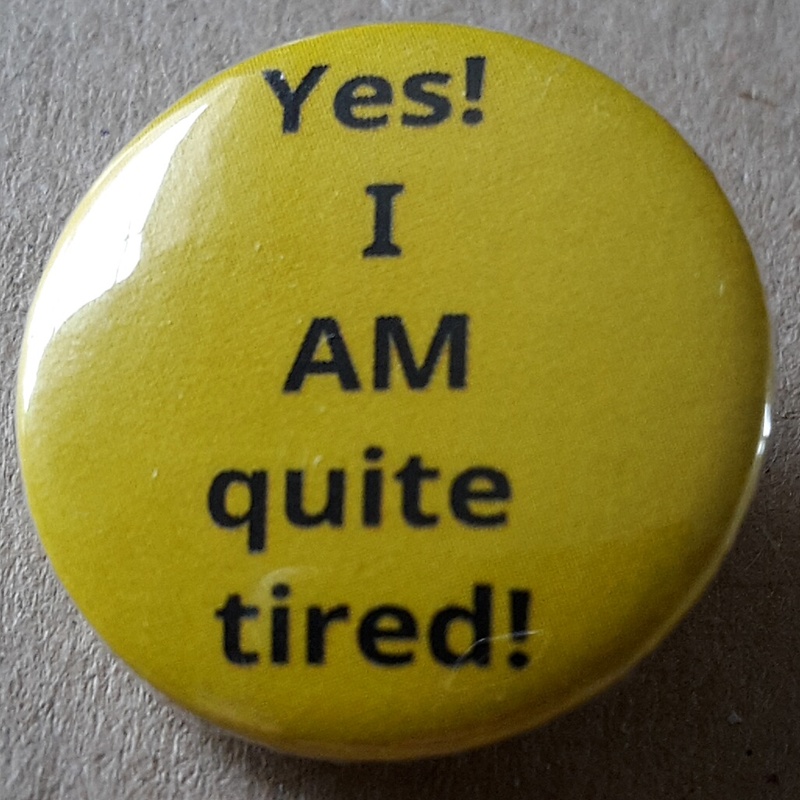 We also had good feedback about some badges we sold for the charity, so I opened up the Thelmatopia shop on e-bay. Last, but not least, we found a babysitter. And I think this one will stay, despite Squeak’s best efforts. Huzzah! Selfcare hash tags all round. *The very lovely and wise @ProseccoSue advises not to shorten Adoption Reality Sharing Experience as a hash tag on twitter.